Nats Minor League Players of the Year; indicator of future success? 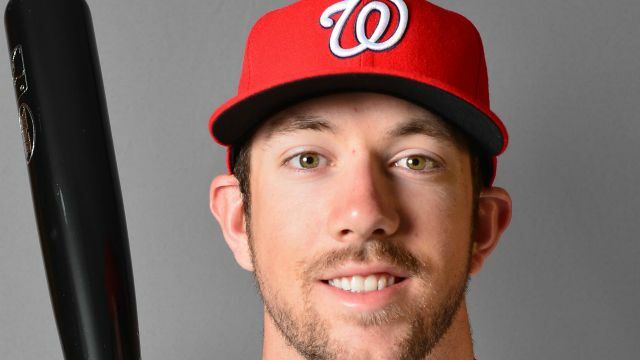 The Nationals on 9/24/14 announced that Lucas Giolito and Steven Souza were named their minor league players of the year for 2014 (announcement made on twitter, h/t to FederalBaseball for the initial posting on the topic). No surprise for Souza, who sported an OPS above 1.000 in AAA. I was a bit surprised Giolito got the nod over someone like Taylor Hill, Austin Voth‘s 2-level rise, or especially what A.J. Cole did this year, but you cannot argue with his season all in all. 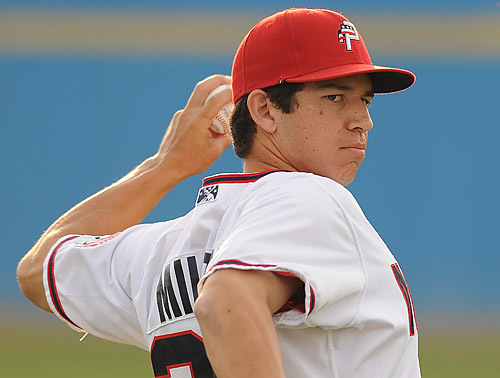 Here’s an look though at the history of the Nats’ minor league players of the year. Does earning the award guarantee future success? I’d say that it is quite hit or miss. Of the 9 distinct hitters named in the Nats franchise history, I think the only guy you could claim has lived up to his minor league success is Derek Norris. Leonard Davis never even made the majors. Kory Casto barely did: hitting below .200 in parts of two major leagues seasons before getting DFA’d. Most of the rest of these guys at best are no more than role players (with “too early to tell” labels on Skole and Souza of course). Of the pitchers; clearly Jordan Zimmermann has blossomed into the real thing, and a couple of the other names here have turned into serviceable #4/#5 starters (Lannan, Milone). Perhaps its indicative of just how poor the farm system was upon the team’s arrival in Washington that the first two pitchers of the system were a guy who never pitched in the majors (Zinicola) and another who had a career 5.30 ERA in 35 MLB apperances over several years. Meyers never came back from a shoulder injury; no shame there. (2nd in a series. See yesterday’s post for Syracuse). The Harrisburg rotation started the year with two starlets, a couple question marks and a few guys who had MLB experience (either in the rotation or on the DL, waiting to get their shot). It was interesting to see a rotation in AA that was (on average) younger and had more MLB time than the team’s AAA roster, but that’s how this season played out. No less than twenty guys got “starts” for the AA team this year, including a number of rehab starts and even more “passing through” starts for guys on their way out of the organization. Harrisburg starters. The rotation started the season with Meyers, Tatusko, Atilano, Peacock and Erik Davis. Here’s how these guys and the rest of the starters fared in 2011. Brad Meyers got the season opening start and it was clear after 6 starts he was ready to be promoted, going 3-2 with a 2.48 era and a sub 1.00 whip. 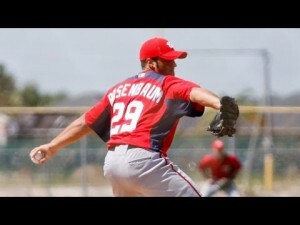 Outlook for next season: (from AAA post): Begins 2012 in AAA, competes for MLB #5 starter in spring. Ryan Tatusko was mediocre at best in a AA starting role, putting up a 5.94 era in 12 appearances (9 starts) before being dumped to the bullpen when Oliver Perez was ready to go. His last couple of appearances were decent though, and he got promoted to fill an opening in AAA’s bullpen, where he played most of the season. Outlook for next season: (from AAA post): Org guy, in AAA’s bullpen or in another organization. Luis Atilano only got 2 starts in and was hammered before hitting the DL, where he remained the rest of the season. He’s 26 this year and was DFA’d, cleared waivers and accepted his assignment, indicating that he’s probably not in the future plans of the team. Outlook for next season: I’m guessing he’s given his release and will be a minor league free agent. Brad Peacock tore up AA, putting up a 10-2 record with 129 Ks in just 98 IP. Most questioned why he was left to languish in AA for so long, clearly having earned a promotion. But he’s young (only 23 this year) and there was not really a hole in the AAA rotation for him until Detwiler’s promotion opened one up. Outlook for next season: (from AAA post): Loses out on #5 starter competition, starts in AAA, possibly in MLB bullpen b/c of his arm. Erik Davis was obtained in trade for disgruntled utility infielder Alberto Gonzalez, had a bunch of starts, a DL stint, and then a string of awful starts that got him demoted to Potomac (where he didn’t fare much better). Final AA line: 5-7, 4.79 era, 1.61 whip and 93/41 k/bb in 94 ip. He’s got great K/9 but not much else. Outlook for next season: there’s not much use for a 25yr old right-hander who can’t cut it in High-A, though his precipitous drop in stats from 2010 to 2011 is cause for hope that this was an aberration year. I’ll guess he features in the AA bullpen in 2012. Erik Arneson started the year with 3 pretty decent AAA starts, then suddenly was in the AA bullpen. This was his third year repeating the AA level with this franchise, clearly indicating that the team views him as an organizational guy. Despite his all-star game appearance and stellar 2011 numbers in AA (8-4, 2.43 era, 1.10 whip in 16 starts and 26 appearances), he’s 27 this year and clearly isn’t going anywhere. Outlook for next season: Org Guy; either a minor league FA or perhaps floating between our AAA and AA levels as he did this year. Shairon Martis is an interesting case; he was in the Nats starting rotation in 2009, and by the spring of 2011 he had successfully passed through waivers and was on our AA squad despite only being 24. Not surprisingly, he did well, posting a 8-6 record, a 3.05 era, a 1.22 whip, had 146/39 k/bb in 133 ip and threw a 7-inning no-hitter. And this all proved, what exactly? As I said over and again during the season’s rotation reviews, Martis getting out AA hitters with ease shows us nothing that we didn’t already know. We need to see him at least at the AAA level to see if he’s ever going to be the pitcher that showed so much promise when he was promoted to the majors in 2008 as a 21-yr old. There was word/rumors during spring training that the team wasn’t pleased with his conditioning or his work efforts, perhaps contributing to his being essentially in the franchise “doghouse.” Outlook for next season: He should be in the AAA rotation, but I wouldn’t be surprised if he was stuck in extended spring training by virtue of a numbers issue. Tanner Roark got nearly a full season of starts in the AA rotation and didn’t have the greatest season, In 21 starts he posted a 9-9 record, 4.69 era, 1.40 whip and pedestrian K/9 rates. He’s younger than his trade mate (Tatusko, both received for Cristian Guzman in mid-2010) so the team will have a bit more patience. Outlook for next season: I think his starting days are done; i’d think he’ll be converted to a reliever and start in the AA bullpen. Oliver Perez was picked up in a relatively high-profile signing after he was unceremoniously released (with $12M still owed on his 2011 contract) by the Mets, who had tired of his poor performances on the mound. The Nats, surprisingly in my opinion, installed him as a starter in AA and left him there the entire season. Outside of a quick DL stint he mostly pitched decently, posting a 3-5 record in 15 starts, with a 3.09 Era and a 1.39 whip. But, as with Martis above, what exactly did we learn from this? An experienced MLB veteran *should* be getting AA guys out with regularity. With the troubles the team had with their loogy (see Slaten, Doug‘s inherited runners and WHIP rate on the season), I’m surprised they didn’t try to feature Perez as a lefty out of the bullpen. Now, with the season over I suppose the team has learned that Perez is now just a mediocre AA starter. 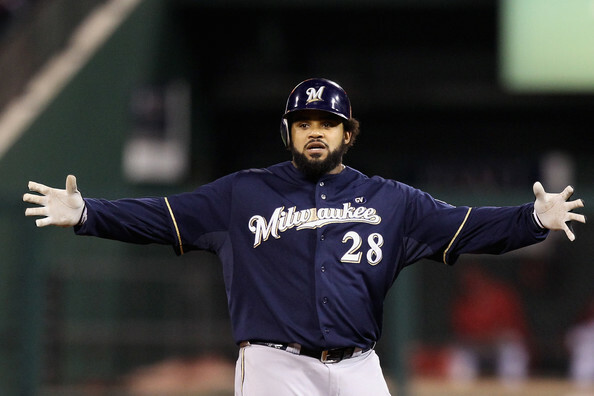 Outlook for next season: Perez will be a FA and probably goes elsewhere to continue his career on a minor league deal, looking to regain a starting job somewhere in the MLB. Denny Rosenbaum got a late season call-up after pitching well in high-A all season and continued his excellent season in AA. His stats for Harrisburg: 3-1, 2.29 era and a sub 1.00 whip in 6 starts. These numbers were slightly better than what he posted in 20 Potomac games, and he seems to be featuring as a Tom Milone-esque crafty left-hander who is riding under the radar. Outlook for next season: at 23 he’s still pretty young and will be in the AA rotation with a mind to get promoted after a few starts in the same way Meyers or Peacock earned their way up this year. Other guys who got spot starts here and there (non-rehab): Jimmy Barthmaier got a couple spot starts but worked mostly out of the bullpen, sporting a high ERA but good k/9 rates. Same for journeyman Carlos Martinez, albeit without the good K/9 rates. Evan Bronson put in a spot start during a brief call up to provide cover for the team during one of their many rain-out induced double headers. Outlook for next season: Barthmaier and Martinez are org guys and may or may not return. We’ll cover Bronson in the high-A post, where he spent most of the season. Harrisburg Relievers: taking a look at the relief corps at the end of the season. Rafael Martin and Hassan Pena split the closing duties and both put up great numbers. Pena was a AAA demotion while Martin seems to be a bit old for the level. Despite this, Martin is representing the franchise in the Arizona Fall League, so perhaps he’ll feature prominently next year. Outlook for next season: both guys seem set to be part of the AAA bullpen. Pat Lehman and Corey VanAllen both pitched pretty well; Lehman earned a mid-season promotion and put up a 3.71 era in AA, earning a trip to the AFL as well. 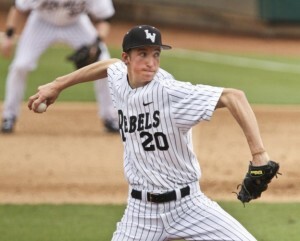 VanAllen is older, lefty and had a great K/9 ratio. Outlook for next season: Lehman stays in the AA pen to start, while VanAllen moves up to AAA as a possible loogy. Pat McCoy struggled in AA, putting up a 4.78 era in 52 innings of work, but he’s also very young and had a 9.0 K/9 rate. Outlook for next season: he’ll start again in AA bullpen, looking to gain on his experiences in 2011. The Rest not already mentioned; Barthmaier, Martinez already covered above. Other pitchers who appeared in AA of note (not including Rehabbing MLBers): Ryan Mattheus started the season in AA and earned two promotions, ending up with good MLB numbers. He’ll make the 2012 bullpen as long as he stays healthy. Matt Chico was awful in 10 appearances before being demoted/DL’d and eventually released. Zech Zinicola and Jeff Mandel started in AA before both being promoted to AAA, where they worked the bulk of the season. Garrett Mock put in two awful rehab starts en route to his own release.